President Trump's director of National Intelligence (DNI), Dan Coats would not comment on reports confirmed by CBS News that Mr. Trump had asked Coats and NSA Director Adm. Michael Rogers to push back on the FBI's probe into whether there was any collusion between the Trump campaign and Russia. Coats, speaking before the Senate Armed Services Committee, said that as an adviser to the president, he is fortunate to be able to spend a significant amount of time with him to discuss national security interests, but given the nature of the regular discussions with the president, he did not think it was appropriate to comment publicly on the reports. "I don't feel it's appropriate to characterize discussions and conversations with the president," added Coats. The Washington Post first reported that the president made "separate appeals" urging both Rogers and Coats to "publicly deny the existence of any evidence of collusion during the 2016 election." Both Rogers and Coats had refused to comply, according to the Post's sources. Coats added that leaks have had a "very significant negative role relative to our national secuirity." "The release of information not only undermines confidence in our allies, but our ability to maintain secure information that we share with them," he said. "It jeopardizes sources that are invaluable to finding out threats." When pressed again on the question by Ranking Member Sen. Jack Reed, D-Rhode Island, Coats again reiterated his stance to not comment on the conversations that took place. "I made it clear in my confirmation hearing that my role in the role of the Director of National Intelligence is to provide intelligence information relevant to policy makers, so they can base their judgment on that. Any political shaping of that presentation or intelligence would not be appropriate. I have made my position clear on that to this administration, and I intend to maintain that position," Coats told the committee. Coats added that he is aware of the investigations that are underway both by the house the senate now special counsel and the FBI, but that he feels the investigations "are in place to get us to the right conclusion so we can move on with a known result." Coats was also asked to provide any relevant materials to Special Counsel Robert Muller to further the FBI's investigation, but replied he had no documents to make relevant. He did, however, offer that if he were called before an investigative committee, he would "provide them with what I know and what I don't know." Sen. Richard Blumenthal, D-Connecticut, also pushed Coats to say whether or not he had discussed the reports to stifle the investigation with Admiral Rogers, to which Coats said "That is something that would like to withhold that question at this particular point in time." Coats also offered testimony on current worldwide threats against the US and around the globe, which comes on the heels of the deadly attack in Manchester, England. 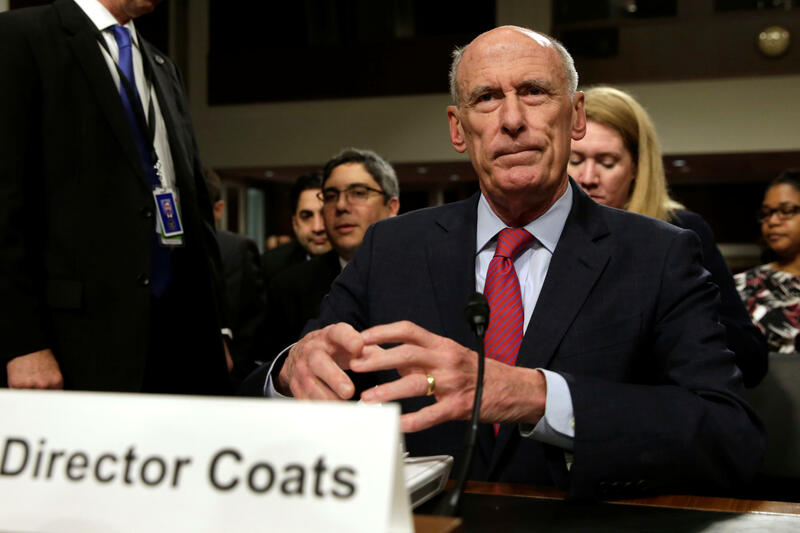 Coats says that the growing threat of homegrown terrorism and cyber attacks continue to pose a significant and continuing challenge for the United States and its allies.